I have steadfastly avoided this topic but I feel I must "come out" now. I shall either alienate my standard readers or cement those. This is nothing if not confusing for me and for you. I am an agnostic. I am not an atheist. I am not indicating there is no God; I have simply not felt what so many of you feel or have felt; I am not denying God. I am simply indicating that, for me, God has not taken me up and provided me with a clear path. Some days I wake up and wonder what is wrong with me. Some days I wake up and think I am free. Some days I wake up and feel I am completely lost. Some days I wake up and wonder what is wrong with me that I cannot feel a compulsion, a need, a drive, to find a greater spiritual level. But on the other hand, I believe, that does not diminish those who feel their spiritual drives. I envy you, in truth. I wish I could feel something here but I have not yet been overtaken. In the meantime I realize that I must, in terms of religion, "fish or cut bait" so to speak. And I have clearly come down on the side of Christianity. I look at history and I look at the history of my country specifically, and I examine material in the public domain and have decided that I either resolve to support Christianity or Judaism or I leave myself exposed to the evil in the world. These are the two predominant religions in the country I inhabit. And I have also examined the basic tenets of these religions and have determined that their core foundations are such that I can support them. How can one not support the inherent GOOD that exists in western religions? How can one not support the clear, common sense, day-by-day tenets of the Ten Commandments, for example? Clearly, there are those who cannot. I can. And I do. I just lack. . . There is a Basic Good in religion such that I can and will support it on so many western levels. 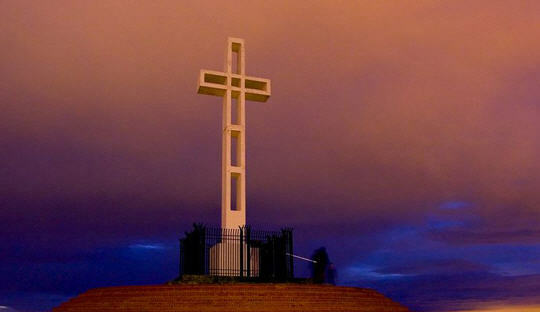 SAN DIEGO — In the best legal news that defenders of the cross atop Mt. Soledad have received in years, the U.S. Supreme Court on Friday delayed its removal until legal appeals in the state and federal courts are resolved. Justice Anthony M. Kennedy, acting on a petition filed by the city, also suggested that the high court might hear the case when the appeals are completed. He added that the court might be influenced by the fact that Congress has passed legislation permitting the cross to be designated a national war memorial. Given the innate goodness of religion, why would persons want to eliminate the symbols of religion, historic and otherwise, that serve to cement and preserve not BAD thoughts, but GOOD thoughts? I am not incapable of sorting good from bad. I have already determined: Islam bad. Christianity good. I have no problem in differentiating this difference. When I say "God bless America" or "God bless you," I mean it. I just wish I could feel smited with a euphoria or a drive that so many others feel. I can only but feel diminished. I'm not necessarily closed; I am simply not struck. That the Mt. Soledad cross will stay for now? That can only be a good thing. And this from an agnostic. Something I'll wager you may have suspected all along. Hit you? ... a lot of us would have to hit ourselves, as your not alone in those feelings. Mr. Z - To me it is a matter of giving due honor to those departed, for we owe them much in their doing for us. Those that wish to tear such down think only of themselves and would dishonor the dead to no purpose save to not be offended by our remembrance of them. And these ones I do not honor. So long as the remembrance is respectful and meaningful to those departed, I have no problem with same no matter what religion, belief, sect or any such thing it comes from. Respecting and honoring those gone, especially those that have died for us, is praiseworth in and of itself. Well BZ: Whoa! I think you only strengthen the reasons why people read you when you are honest like this. I am honored that you felt comfortable enough to share this part of yourself with us! I DO think the Newdows of the world are a bunch of assholes, pls pardon my mouth here, but damnet what happened to respect? I think the Supreme Court is onto something when they are trying to designate the cross as a historical object, which it IS!!! Geesh, why even go there though? There is no other place in the world where people are afraid to be Christians (except Islamic countries) so what the hell gives? I am saddened that so many folks today are afraid to admit to their faith or not. Hence this is a very POWERFUL post. I wish you well in school and will pray for you and your family! AJ: I always love what you have to say. I don't know how you alienate readers by just being honest. I appreciate your honesty and its nice to know where people are coming from. But as one of those Christians who has been "struck" I will be praying for Christ to become real for you in a personal way in your life :-). Folks: all thanks for your continued support. I may be the most conflicting statement of belief patterns ever issued from me before or since, but I clearly recognize that fashion in which this country was founded and what our Founding Fathers meant when they indicated they wished freedom OF religon and not freedom FROM religion -- considering their history and reasons for escaping England and, moreover, the mono-oppressive Church of England. All they wanted was the chance to worship as they pleased and not be beholden to one church only. Some days it really IS as simple as that. And I have drawn the line and I know on what side of the line I stand and with whom and for what expressed reasons. This a good country built by good people and those religious amongst us are quintessential Good People. Again, it is THAT SIMPLE. What I CAN believe in is immaterial to a degree; I know that the basic elements of western religions are GOOD; how can one dispute any of the components of the Ten Commandments? Religion provides Man the structure, continuity and guidelines for living a Good and Proper life. Coming from my individual viewpoint I shall never understand those who only wish to tear down that which is Innately Good and is the framework for logical and common sense living. I too wish I could feel something akin to struck but it escapes and I must be honest. But far be it from me to ill recognize that which is a constraint on Evil -- constraints we shall ever need, due to our fragile selves and the overall Nature Of Evil itself -- something of which I AM very familiar by dint of my profession.